Why just ski at one resort day after day, when we can explore a new place every day?! We are blessed with well over 30 ski areas within driving distance, and that's just counting Oregon, Washington, Idaho and British Columbia. You could add to this number the 12 ski areas around Lake Tahoe, and the 10 ski areas around Salt Lake City (because Lake Tahoe is only 10 hours away, while Salt Lake City is a 12 hour drive). So, over 50 ski areas are within reach! How many of these have you skied? See map below. In fact, you could even add a few more resorts in Alberta and Montana (Big Sky is within a day's drive), ... and you could be skiing a different area every day for 2 months! But, let's do them a few at a time! See map below. 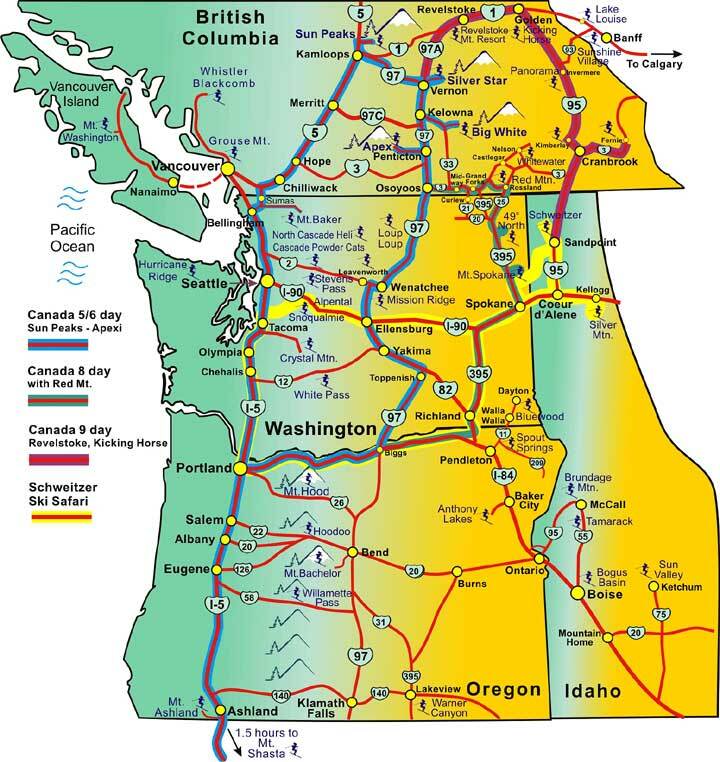 About a dozen of us got into our cars and carpool and caravaned up north, first into Canada, and later into Idaho, for 2 separate "ski safaris", Idaho (in 2004/2005) and Canada. for 4 years in a row (from 2004 though 2006). And we might continue do it again (or something similar, or improved version) in the coming yeas! It's an informal "trip". It's an adventure. It's fun! It will be very affordable, since we'll share the cost of gas, and the cost of lodging. At the end of each day, we'll drive on to the next area, exploring a new place each day! We are lucky to live in the Pacific Northwest, where there are dozens of great ski resorts, all within a day's drive! See map below! Any number of people will do, but 3 people per car seems to be a perfect number. Conversation flows well with 3 people. Two might be too few, and 4 might be too many, since there's always the possibility that 2 conversations might be going on simultaneously - somewhat interfering with each other and competing with the road noise. We'll use portable radios and/or cell-phones to communicate between the cars. Some people may prefer the flexibility of having their own car. Others may like to carpool, either just for the sake of company, or because they might not have a 4-wheel drive vehicle, which is a good choice when you travel into the mountains hundreds of miles away from home in the winter. Some people, especially couples, may prefer a room of their own. Others might consider sharing a room between 3 or even 4 people, to make the trip really affordable. Around Thanksgiving, or early December. 5 - 6 days total. See map below. We'll follow I-5 up, and Hwy. 97 down. Day 0. (evening) Leave Portland around 5 pm (or as soon as possible after work). Drive abt. 4 hrs. to Bellingham. Day 1. Ski Mt. Baker, then drive abt. 5 hrs to Sun Peaks. Day 2. Ski Sun Peaks then drive 2.5 hrs to Silver Star. Day 3. Ski Silver Star then drive 2 hrs to Big White. Day 4. Ski Big White then drive 2 hrs to Apex. c) Ski all day, then drive 4 hours to Wenatchee (Mission Ridge). Day 6. Ski Mission Ridge Ski till abt. 3 pm, then drive abt. 5 - 6 hours to Portland. This day 6 is optional, assuming you choose option 5c above. For more detail, including hotels, see the Canada ski safari page (large PDF file)! Lift tickets were free! This certainly made the trip affordable. Snow was aplenty! Phil and Emilio spent only $208.68 for all lodging and transportation (gas) for 5 days skiing & 6 nights lodging. This included Mt. Baker. Most nights, it was just the two of us in a room. One day, the expenses were shared between 4 people, and on another two days the cost was divided by 3 (as we paired up with other people, who later went in a different directions). Bruce and Linda spent about $275 per person for 4 days/4 nights. Bob and Gail spent only $149 per person for 4 days and 4 nights. This was thanks to the fact they opted to stay in a hostel (right within the mountain village) at Big White and Apex. As you see, the cost differed, depending on the choice of accommodation and the number of people that the lodging was shared with. Still, it was a great deal for all of us! We planned for this in February 2005, but there was no snow in one of the driest winters in recent memory. But, we could do something like this in the winter of 2005/2006. We could either park ourselves at Schweitzer for 2 or 3 days, or we could ski Schweitzer one day and Silver Mountain (Idaho) another day. Maybe even a third day at Mt. Spokane. Day 0. Leave after work. Drive up to Alpental/Snoqualmie (abt. 4 hours) or White Pass (3 hrs), with the intention of skiing there the next day. Alternatively: If you can leave Portland early enough (say, by 3:00 pm), you could drive all the way to Spokane or even Schweitzer. Day 1. Ski at Alpental/Snoqualmie or White Pass. Then drive to Idaho. Stay the night at either Sandpoint or the Schweitzer mountain village. Day 2. Ski Schweitzer Mountain. Then either stay for one more night, or drive 1.7 hours to Kellogg, Idaho (which is right next to Silver Mountain). Day 4. In the morning, drive another hour and ski either: Alpental/Snoqualmie, or White Pass, or Spout Springs or Bluewood. After another full day of skiing, it's a 4-hour drive home from Alpental/Snoqualmie, or a 3-hour drive from White Pass, or about 4.5 hours from Spout Springs or Bluewood. To join any of these ski safaris, just email us at info@mthigh.org. * Vancouver, B.C. has 3 ski areas in its neighborhood, of which only Grouse Mt. is shown; the other two are Cypress Bowl and Mt. Seymour. * Norquay ski area, near Banff, is not shown. * Abt. 10 ski areas in Utah. You can drive to Salt Lake City in about 12 hours. * Abt. 12 ski areas in the Lake Tahoe area, California. It's only a 10 hour drive, with a couple of convenient places to break the journey half-way (at Mt. Ashland or Mt. Shasta). * At least 3 more ski areas in Montana (Big Mountain, Big Sky, Bridger Bowl). Yes, you can get as far as Big Sky and Yellowstone Park in a single day! When you add up all of the above, we have over 60 ski areas within a day's drive!